First of all, check the float level in both carburettors against the figure in the workshop manual. Next, plug the brake servo take-off stub on the inlet manifold to eliminate possible air leaks here. Use a short length of rubber hose with a bolt tightly screwed into the end. Take the car for a test run, bearing in mind the increased pressure you’ll need to put on the brake pedal. If this doesn’t solve it, we wonder if the carburettors are not receiving sufficient supply of fuel at times of high demand. 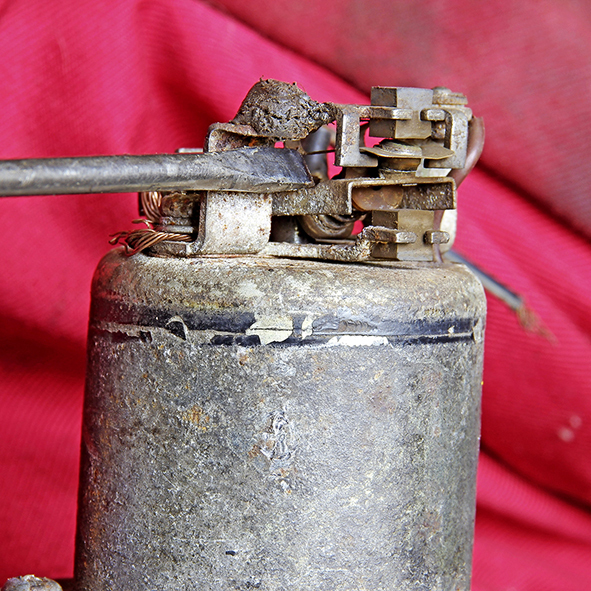 This could be due to a blocked fuel filter or a blocked or damage fuel line on the suction side of the pump. It could also be due to a fault in the fuel pump – perhaps the one-way valves are not sealing completely or there’s a mechanical or electrical defect. We’re sure you’ll have checked the valve clearances, but it would be worth doing a compression test just to make sure they’re all sealing correctly. An exhaust valve that isn’t making correct contact with its seat will get very hot and cause running-on as the residual heat ignites the fuel-air mixture. Lastly, the HIF carburettor has a bimetallic spring that slightly adjusts the position of the main jet according to the temperature of the fuel in the float chamber. As the fuel gets hotter, its viscosity reduces and so the bimetallic spring raises the jet a little to restrict the flow of fuel accordingly. It might be worth examining this to make sure the spring has no defects, is installed correctly and that there’s no play in the mechanism that might allow the jet to rise too far. Yes an air leak can course running on ,best checked with a can of WD40, being sprayed on various parts of the inlet manifold ,carburettors and any air intake pipes . More likely the engine requires a de -coke ,can be checked with a compression tester ! Also check the water temperature is not getting too hot, check the thermostat is working as i should. My MGB started running on checked everything but could not cure the problem a friend said about the thermostat, checked mine it was only opening part the way and this was causing the problem. New thermostat problem solved. Hi , what’s the easiest way to remove an MBG sump ? I ask because of the inaccessibility of the front sump nuts .